I've noticed on recent trips to the shops that they are full of proper bootcut jeans again. As a pear shaped girl, I celebrate their return! There is no getting away from the fact that boot cuts flatter more women than skinnies...provided you wear them skimming the ground with just the toes of your shoes showing. No showing your heel, otherwise, they look awful. They add inches to your leg length and balance out wider hips. Managed to pick up a pair late last year in Boden where they are now reduced to £23 in the sale & they are a great shape - quite tight in the thigh with just enough flare at the ankle. 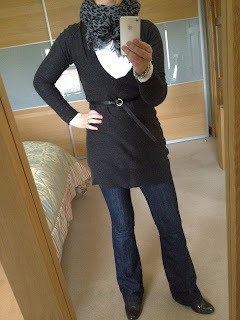 Wore them today with my charity shop All Saints jumper (more on another blog) and you you can just about catch a glimpse of my Mumsnet Scarf. Best ever bargain that livens up any plain outfit. Grey patent shoe boots are from Clarks. Got them in a sale a couple of years ago and they are one of the few heeled shoes I have that are all day comfortable. Grey is a fab colour for footwear as it goes with just about everything. You can still pick up these boots on Ebay if you're lucky size-wise. Happy Monday SG Style Girls!